Percival is a wicked monster who uses his cape for invisibility and shoots plasma bullets from his three mouths. He also creates a black tornado with purple sparks to thrash his challenger. Percival has two dragon head wrist guards, and his body is covered in armor-plated steel. The horns sticking out from his head and shoulders are unbreakable. Percival has a special bond with Ace. 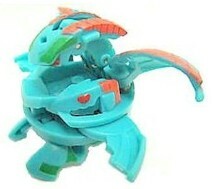 Together they battle to free the enslaved Bakugan. Purchase Percival from Amazon now!